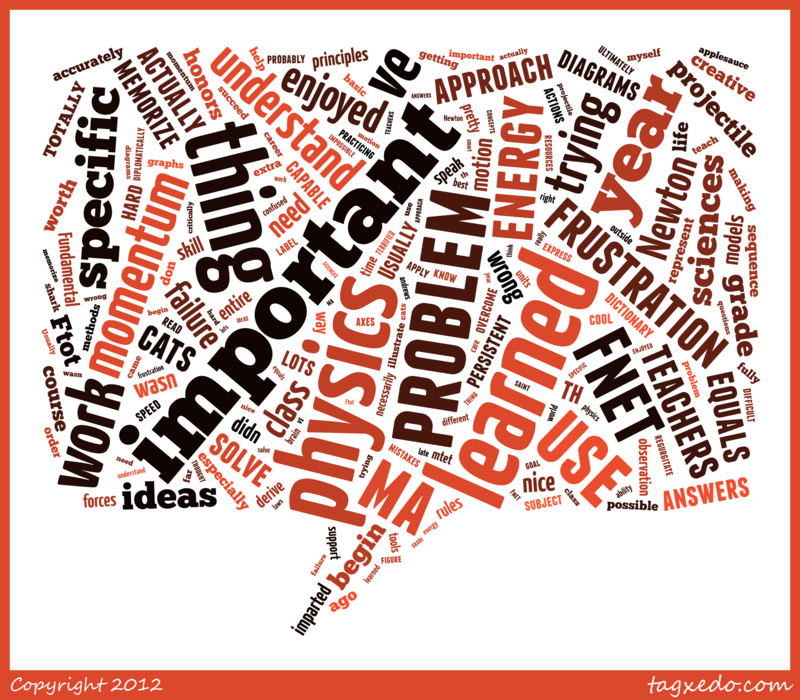 May Course Evaluations: What did you learn in physics class this year? – Physics! Blog! These responses are typically pretty short, contain a lot of variety (other than the ubiquitous “Fnet = ma” answer), and are (for me, at least) really enjoyable to read. So instead of just giving a handful of them, I’m including all of the responses. All of the Honors students answered them, but not every regular Phys! student wrote something for these questions. Question: What is the most important thing you’ve learned this year? That my 8th grade teacher was wrong. which is nice because she wasn’t very smart to begin with. I also enjoyed learning about projectile motion and energy. I can do things I didn’t think I was capable of – I just have to be persistent and not get frustrated. The most important thing I learned is how to approach problems using what we have learned in class. Usually, the hard part is thinking about what models to use, and how to use them together to solve the problem. This is the most important thing I’ve learned. How failure in something can be good as you learn from this failure and move on trying and trying again. This skill is extremely important and this is what honors physics imparted on me along with the entire course worth of ideas on physics. Fundamental principles. Even though it is a science you can get creative with it! Physics rules my life!! I’ve learned how to speak about things (i.e. forces, energy, momentum) in a way that I actually understand beyond a dictionary definition and I’ve been able to dervive things about them based on observation and my own work, which is pretty cool because if this were a few hundred years ago, Newton’s laws would TOTALLY be mine first. Everything has its time and uses. So everything! Mostly about how to represent things accurately and how to support ideas. The most important thing I learned this year was how to read a problem for what I know and apply what I have learned, even if I don’t understand necessarily how to go about a problem. I probably have the tools to do it, I just need to work through it. To label my axes and units, and be as specific as possible. The most important thing I learned this year was about how I learn–that it’s critical to keep trying and practicing difficult problems and making mistakes in order to ultimately learn something important. How to express frustration diplomatically. How to use resources (teachers) outside of class when I need extra help. How my brain works and the methods of learning which work best for me. How to fully understand a concept rather than just memorize and regurgitate it. That there is more to learning than just getting answers right. The most important thing I’ve learned this year is how to use different concepts and graphs to figure out each physics question. I have learned how to illustrate goal-less problems with diagrams and then use these diagrams to answer specific questions. Other than the basic concepts of physics and how the world around me works? I was TERRIFIED when I came into physics, I learned rather late in my saint andrews career just how far I can get in the sciences. I learned that I have the ability to solve problems that I thought were really impossible. I’ve had students write misconceptions as their responses to this question (“How cool it is that you can figure out the net force just by knowing the mass and how fast an object is going.”), so there’s always the chance that this question won’t be the ringer of feel-good answers on the course evaluation that you expect it to be. All good news this year, though. They gave me a lot of what I was hoping to see (and hopefully not because they thought it was what I wanted to hear): the important things they learned this year were pretty well spread across big physics ideas and across learning about how they learn. Some found the physics knowledge really valuable, others found the experience of doing something that at first seemed impossible to be of utmost importance, others found important approaches to the class that they will carry with them to future classes, both in science and in other disciplines. Hooray! Oh, and for good measure, here are those responses in a word cloud. Click to see it much larger (if you’re into that sort of thing). Okay, just one more question, then it will be time to wrap up this year’s course evaluation show and tell. Question 2: What are you most proud of? What are you most proud of with respect to your work in physics class this year? How my ability to comprehend complex situations has improved vastly over the year. I still can’t believe that I have finished a year of Honors Physics. Initially it felt like a course that would drive me nuts, but it was pretty manageable. Understanding things that look completely incomprehensible to others, especially finally getting the MTET objectives. I worked hard to understand it, and it finally paid off. I am most proud of being able to solve basically all the problems in the final exam review packet. I would have never had any idea of how to do those problems before, so that shows I have learned a lot. I MADE IT. (Well, almost.) Physics does not come easily to me and I am proud that I persevered and put in my best effort. Probably my ability to stay ahead of the class and learn new concepts. I heard it was “”death-on-a-stick”” so the fact that I am passing and learning is a great feeling. So there I am, in Budapest, walking, around. It’s beautiful, and cultural and FILLED WITH FOOD!! But the only thing I could think about was what we could find out about our airplane. Given what the little screen tells us(the screen has the distance traveled, altitude, speed of the plane… ect.) I proceeded to voice these opinions and got slapped a rand total of 3 times. Le Extreme Walrus and his arch nemesis, Le Extreme-ly Evil Walrus. In all seriousness, I’m just really glad to be able to apply all of the math I’ve learned (which I’ve always enjoyed, but never had much use for) in a way that helps me figure out how things work. I’ve always had a fascination with the ‘how it works’ aspect of things, and I have to say, this course has been one of my favorite opportunities I’ve ever gotten to try this out. I’m most proud of my ability to think in a more logical and creative way figure things out that I had the capacity to do, but never knew how to solve on my own. My 100’s in all three national physics diagnostic tests. I got all 2s on A’s! I am most proud of my overall work of the year. I feel that I learned a lot and enjoyed the problems involving planets and celestial objects. being able to analyze problems and do real physics..
How we kind of teach ourselves everything we’ve learned as opposed to memorizing something out of a textbook. Being able to do problems on my own without the teachers help. I was most proud of going into the circle problems with NO understanding whatsoever and coming out with that being my favorite thing. I also am proud of how I have been able to work with hypothetical situations and solve for values. I am most proud that I made it through the year! I’m happy that I pushed through problems and concepts that I didn’t understand in the moment to achieve the comprehensive understanding that I have now. I definitely see how perserverance in regards to physics problems can pay off in the end. Very little. I do not feel that I have exhibited quality work or behavior in this class. I also do not feel that Ms. O’Shea created an environment in which one actively wanted to do one’s best, but rather one in which it was easy to float around the realm of mediocrity. I am most proud of how my work ethic has changed, and where I was at the beginning of the year to where I am now in my understanding of physics. I am proud of my class participation. Although I didn’t speak up as much as I should have, I payed close attention and made good use of my class time. Even though I didn’t always do well on the weekly quizzes, I was always really excited when I finally understood how to do something when I met Ms. O’Shea. That I can now look at any mundane phenomenon and can think on why it is occurring. I am most proud in my growth in understanding physics and my confidence in tackling goal-less problems! I was scared to be in this class in the beginning of the year and wasn’t sure how I would ever be able to answer a question without an actual question with diagrams and equations. However, I have done numerous goal-less problems throughout the year and really think I have come a long way. Though I don’t always know how to solve the problem, there are always some diagrams I know how to draw. I’ve a few out of class conversations with the teacher that I have rocked because I figured out some cool conceptual things about physics. My most proud moment in physics this year was the end of the first marking period, where I had all 2’s, and when I looked onto active grade, I seen nothing but green. It has been much more difficult since then, and the teacher is not that helpful when it comes to trying to help teach new material, especially when classes are missed becuase of sports. In the second semester I think that I was able to make much better use of class time, perhaps not quizzes, but I learned complex objectives and was able to hold my own with my classmates as things became complicated. I reworked an equation that was very difficult for me in the beginning of the year.after my 3rd attempt I finally managed to derive it. It was pretty epic. The themes in these responses are pretty similar to the first set. Several in the honors classes were most proud of grades, though in some cases, I think the pride in the grades was connected (at least in part) to the fact that the grades represented real understanding. The regular classes contained a couple of responses from unhappy customers (the one about being unhelpful for learning new material when the student isn’t in class—well, you know, I have to agree that I am not very good at teaching students who aren’t there). In both classes, a lot of overcoming incredulity with respect to the idea that they were capable of learning physics. The classes were tough, and so were they (in equal amounts and opposite directions?). Overall, really great feedback about what they feel they have accomplished this year. I feel good about how these classes went this year. Definitely the best year so far, and also reaching a stable, high level of goodness in the Honors Physics class in particular. The regular physics class needs the most work now. I need to be able to capture more investment and motivation from these students, many of whom are not particularly excited to be taking a physics class in the first place. Certainly almost none of whom feel they have chosen to take the class (whereas every Honors Physics student has chosen to move from a regular class—either freshman Biology or sophomore Chemistry—to the honors track, meaning they have all chosen to take the class). I have some ideas about how to do that and ways in which the two courses should differ more because of the difference in demand from the clientele. More on that soon enough. This blog will be back to probably more helpful posts that are more about my plans for next year’s classes soon. I will also try to fill in the rest of the model-building storylines from this past year now that I have more time (hooray for summer). I have a start on the central forces (circular motion) and oscillating particle model posts and on the energy pie charts explanation. I also need to tackle constant velocity/the first day of classes. I am currently thinking about and planning a huge change in the order for the storyline in my regular physics classes for next year (starting with conservation laws and ending with unbalanced forces and systems). As those ideas become more concrete, I will certainly write about the plans here. Watch this space (well, in a month or two, probably). Finally, there were a few other questions on the course evaluations (they wrote comments about me, clicked a choice about the pace, and gave advice to next year’s students). I don’t think those need to be published here (though the best of the advice will probably make an appearance when I revamp the handouts for next year’s binders). If anyone wants the full list of questions (which you are of course free to adopt, alter, etc), just leave a comment and I can make those available for you. There are great questions that ask students to be genuinely reflective of the class, you and (most importantly) themselves. Mind if I take a gander at the full list. Plan on incorporating them into next year’s evaluations. Thank you so much for your thoughtful feedback. We care a lot about the continuous improvement of this class, and your help is crucial. About how much time did you spend on physics (outside of class) each day? What did you do with that time? Did you change your out-of-class practices from the first to second semester? Did you take advantage of Sunday quizzes? Extra help from your teacher? Why or why not? In what ways did you manage your own learning when preparing for in- and out-of-class assessments? Were you able to use learning objectives to manage this learning yourself? The physics teachers have put thought into all aspects of the course and have used research about how people learn (and especially how people learn physics) to guide the course design. Some of the features of the class are probably different from most of your other classes, so we are especially keen to hear your feedback. Please give a concise explanation of the grading system used in this class. The purpose of this question is to compare how students have interpreted the system to the physics teachers’ ideas about the system so that we can improve how we communicate those ideas. Has the grading system had an impact on your learning and understanding of physics? Give an example to help illustrate your thoughts. Please give a concise description of how you have been asked to use your (physics) time outside of physics class this year (aka the homework policy). The purpose of this question is, again, to better understand how students have understood what the physics teachers have asked of them this year and to improve our communication next year. Has the homework policy had an impact on your learning and understanding of physics? How did the pace of the class feel? What is the most important thing you’ve learned this year? What advice would you give to someone taking this class next year? Remember, we actually pass on a lot of these suggestions on a handout in the binder! Okay. We (the physics teachers) are about to be busy writing descriptive comments of your work this semester for you and your parents. Here’s your chance to return the favor and write a comment for your teacher. Remember that the best comments have both specific praise for what strategies and work went well and constructive feedback with advice for improvement. Contribute a physics joke or haiku? Anything else you’d like to tell your teacher? I do these in Google Docs, and I give them time during class to fill them out. I’ve found that if I don’t do that, I won’t get them all back (I still was missing about 4 or 5 of the regular physics students even though they worked on them in class…). I usually tweak the questions a little each time, but generally use something similar to this set. I like to have them do a little bit of self evaluation first to both give context to the rest of their replies and because I usually get more thoughtful responses if they’ve thought about their own contributions to the class first. Those really are feel-good responses! Way to go!! I can’t wait till mine are that way too. 🙂 Your kids sounds like they are so much fun, and have a lot of personality. It is great that you get to know them a lot out side the classroom too, being at a boarding school. I was thinking how I LOVE going on retreat with my kids and bonding with them at a entirely different level. Anyway, the kids are a lot of fun. And I think the boarding school aspect does help a lot. It would be much tougher for me if I didn’t also eat breakfast with them, turn their lights off before they went to bed, and watch TV with them on the occasional weekend. Now that I’ve been here for a while (and worked with the freshmen on dorm for two years), I basically know all of the returning students really well before they get to my classes. That’s huge. I would really be interested in your evaluation questions. Thanks for sharing what you do through your blog and posts! One of the comments mentioned your student being the proudest of his 3 national physics diagnostic test scores. What three was the student referring to? MBT, FCI, and ECI? Do you give them all on the first day or do you scatter them throughout the year?